Las Vegas shows off its historic side. 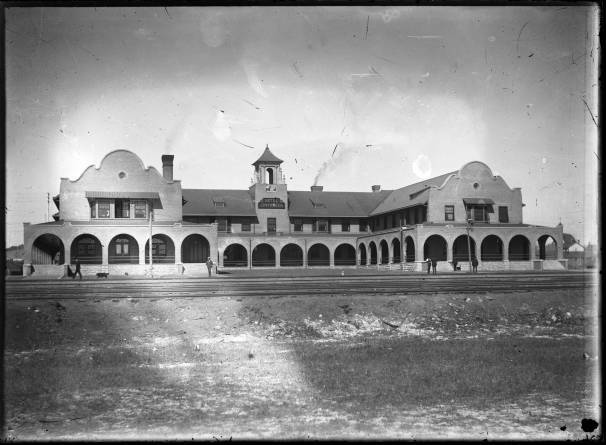 Above: The Castaneda Hotel in its glory years. Palace of the Governors Photo Archives. Renovation stops for one day at the Castaneda Hotel, a onetime gem of the Harvey House system, to let the public check out the status of its face-lift. The long-vacant building gleams as the star of the August 4 Places with a Past tour in Las Vegas, New Mexico, a town with an impressive inventory of historic homes and buildings. Others on the self-guided tour include two classic stone buildings—the Trolley Barn, which now houses New Mexico Highlands University’s Media Arts Department, and an old wool warehouse that’s been reborn as the Skillet Restaurant. (Sip a craft beer on the riverfront patio while musicians perform.) “Every year I say, ‘This is the last year,’ but then new businesses and newly renovated homes crop up,” says Kathleen Hendrickson, of the Las Vegas Citizens Committee for Historic Preservation. The dozen stops include a charming adobe home, a sprawling Victorian estate, and the always popular Montezuma Castle. Allan Affeldt, who saved La Posada in Winslow, Arizona, oversees the Castaneda renovation and will talk about his boutique-hotel plans for it. With their $25 tickets, tour-goers also receive directions to a few extra sites not on the map—plus tips on where to eat, sip, and shop (505-425-8803, lvcchp.org).